Varanasi is magical. Walking its streets you feel back in the middle ages: small, cobbled alleys filled with filth, people and animals. Cows, goats and solitary dogs walk freely around the the city with complete calm. A labyrinth of streets in which it’s impossible to get one’s bearings, with cloth and sweet shops on every corner. The alarm sounds at five AM. Today, surprisingly, I don’t have a hard time getting up from bed, I don’t really understand why but I have been thinking about this morning for some time before starting the trip. Maybe it’s my rebel’s soul getting excited: on the first trip I made to India my grandmother’s only warning was that I should not bath in the river, and on this trip once again everyone has warned me against it. Walking Kassi’s empty streets in the early morning is an experience onto itself. Advancing through the crowds during the day is tortuous and the deafening sound of a motorcycle beeping to pass by has got me on my nerves more than once. At five AM the cows are our only travel companions. Before I was saying that it’s streets are like a labyrinth, but this isn’t a great comparison because in them you don’t usually get lost – if you continue walking you always arrive to her: the mother of the city, the Ganga river. And this is precisely what Marion and I do, following the alleys we arrive in an open Ghat with a panoramic view of the riverside city. The sun is starting to come out and reddish light soaks the scene. There is a tourist sitting down calmly and two or three Indians bath in their dhotis. I take advantage of the scene to take some pictures, some of them could be keepers. When I sit cross legged on the shore what seems like an ocean extends in front of me. I close my eyes. I concentrate on my breath. I try to perceive the world around me. Vipassana - what it is - try to perceive the reality of things. Everything is still calm, birds chirp in the morning light and I hear the sounds of a boat roaming the water. As I do when I’m about to try a climb, I give myself some time till I feel I am ready for it. Then I bath. I’m back in India in the middle of a new trip and many interrogations roam my head: why return here? Why not visit one of the other million countries that I still have to discover? My first answer is not a very logical one, but it's the main reason of my return: I had the feeling that I needed to return to India. I can't quite explain this, but if I listened to my heart it wanted to come here again, to learn from it's people, eat its foods and see it's landscapes once more. In 2015 we spent 2 weeks in a friend's house in Kerala after a chance encounter in an Indian train. It's truly incredible what chance encounters can lead you to if you are sincerely open about interacting with people. This same friend, Krishna, organised a trip this year all over India, the trip is based on three personalities: Gandhi, Buddha and Sri Ramana Maharashi. The idea was to think about and learn from Gandhi’s concept of non-violence, Buddha’s renunciation and meditation principles and Sri Ramana’s concept of the self. I am not one to skip the opportunity of travelling a far away country with local friends and learning about such enriching concepts. I think this trip also comes at a great time for me personally, a time when I am realising that these kind of concepts are dearly missed in the western world. I believe that a greater spiritual education would be of great help to us westerners. Western society is in some sense forgetting basic principles of interactions with others and with one’s own self and exchanging them for a society of achievement and individualism, were monetary interests govern all conduct. My concept of spirituality is not linked to any supernatural entities or concepts. My spirituality is related to my personal search for happiness through the exploration of my self. Wikipedia defines freedom as the capacity of the conscience to think and act in accordance with a person's free will. The word freedom has Indo-European origins, coming from the root prī, meaning "to love" - "afraid" comes from the same root, using the prefix 'a' to denote contrariety. Freedom - Fear. Lately I have thought about the concept of freedom, and I like Wikipedia's definition. Why do we feel more free in nature, outside the city? There's certainly a part that's due to geographical mobility (we can go wherever we want), but there's also a deeper sentiment, one associated to leaving behind society's restrictions and stereotypes. For me, the big question is if this kind of liberty hides a path to happiness and, if so, how to follow it. Somewhere above the Alps, France, 2018. Massif de la Chartreuse depuis le Lac de Crop, France, 2018. "This is the sea shore. Neither land nor sea. 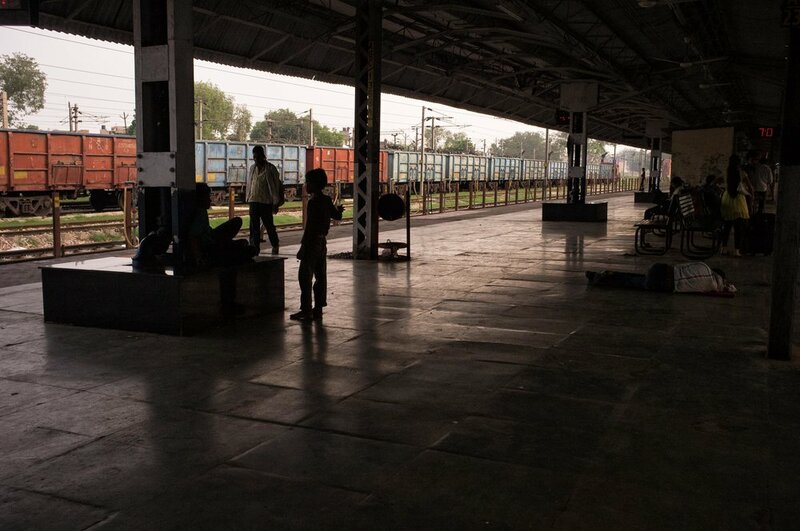 It's a place that does not exist"
I always associate traveling to India with trains. A remain of their British era, the Indian railway system is a splendid way to visit the country: authentic, very social and full of metaphors. I'll take an Indian train before a touristic spot any day to take photographs. Places that are normally packed with people, full of odours and contrasts. My memories are of blue nights of sleep followed by rush hour and the smell of the sun. Spicy chai and nan bread passed through windows between the chaos. One of the few spaces where tourists really interact with the locals. They often serve to discern the tourists from the travellers. The tourists will talk of them as dirty places, a time loss before reaching their destination. For the traveler they represent something: the journey, the search, a part of the dream of voyage. he rodado senderos y caminos. el viento, el sol, el salitre, la arena. y he tenido que bajarles de la nave occidente. Jornadas de montaña de Moralzarzal. Los pasillos llenos de gente que quiere ver a Ueli Steck, la maquina suiza, una especie de superheroe que se dedica a subir picos. Fue ahí cuando me firmó la foto que tengo al lado mientras trabajo cada día. Yo estaba el primero en la cola (evidentemente) cuando se le acercó un chico alto, moreno, con barba y con pinta de norteño. Era el hermano de Iñaki Ochoa y quería darle las gracias por el esfuerzo que hizo en el rescate de su hermano. Le dijo que en Pamplona siempre tendría una casa. ¿Y gracias por qué? Porque en 2008 después de subir hasta 6100m y bajar al campo base porque había mal parte meteorológico, cuando ya estaba descansando y con una cerveza en la mano, Ueli recibió una llamada por teléfono satélite que le decía que un navarro estaba muy jodido a 7400. Y porque, sin pensarlo dos veces, con calzado de trekking y gore tex ligero tiró. Salió una hora después de la llamada sin saber muy bien como iba a llegar hasta allí. Y después de un ascenso contrarreloj de 1200m por una de las aristas mas peligrosas del planeta (la cara sur del Annapurna) convenció a Horia para que se bajara y se quedó él con Iñaki en sus últimos momentos. Pero sobre todo porque en ese momento no tenía ni idea de como iba a bajar de allí, con un temporal fuera y un cuerpo inerte al lado, pero cuando tocó tiró hacia arriba para ayudar en lo que pudiera. Gracias Ueli, parece un sin sentido o una exageración que te las de yo, pero gracias por formar parte de la materia de la que están hechos mis sueños. Espero que tu también estes por alguno de los cielos de Suiza, colgado en alguna estrella que esté llena de montañas. 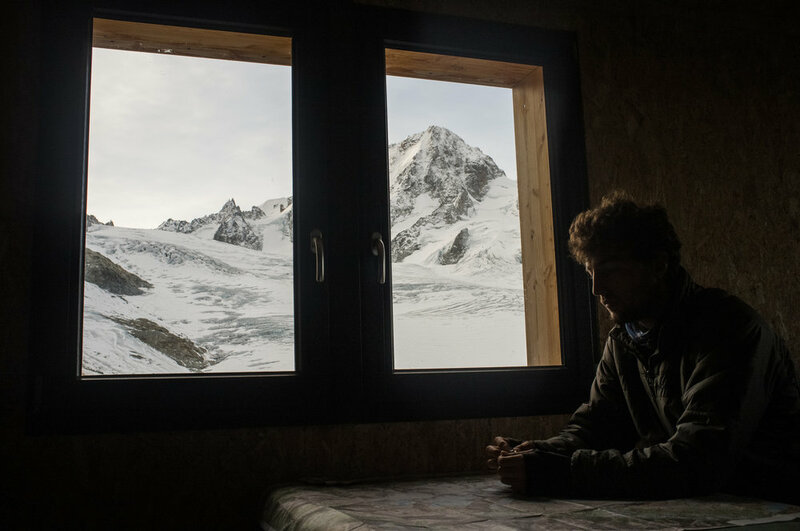 Refuge Albert 1er, Northern Alps, France, 2017. Some say they remind us of what liberty is, some that we go there looking for our dreams. For me they serve to reposition my life, they move away the darkness and help me find my place and path. Man overcomes himself, affirms himself, and realizes himself in the struggle towards the summit, towards the absolute. In the extreme tension of the struggle, on the frontier of death, the universe disappears and drops away beneath us. Space, time, fear, suffering, no longer exist. Everything then becomes quite simple. As on the crest of a wave, or in the heart of a cyclone, we are strangely calm - not the calm of emptiness, but the heart of action itself. Then we know with absolute certainty that there is something indestructible in us, against which nothing can prevail. A flame so kindled can never be extinguished. When we have lost everything it is then we find ourselves most rich. The summit is at our feet. Above the sea of golden clouds other summits pierce the blue and the horizon extends to infinity. — Lucien Devies, preface to "Annapurna, The First Conquest Of An 8,000-Meter Peak"